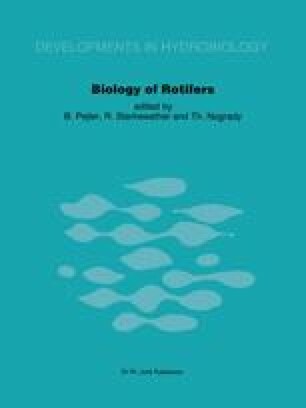 A culture system for the rotifer Brachionus plicatilis was designed to maintain higher food conversion rates and stable population densities. Two 2001 plastic tanks were employed in the culture experiments, tank A for ‘feedback’ culture and tank B for a control culture. The experiments were carried out for 70 days at 24°C, light intensity, 1500 lux, and a photoperiod of L:D 15:9. B. plicatilis were fed once a day on baker’s yeast and Chlorella. Food conversion rates in tanks A and B were 24.7% and 10.1%, respectively. Population density of B. plicatilis in tank A was consistently stable at 100–150 ind. Ml−1 throughout the culture period. Density in tank B, however, showed large fluctuations after 40 or 50 days and by the end of the experiment, declined to zero.